Around 300 protestors, who opposed the planned loyalist 'Love Ulster' march, clashed with gardaí in Dublin city centre this afternoon. The trouble broke out at 12.45pm at the junction of Parnell Street and O’Connell Street, just yards from where an estimated 800 marchers commemorating the victims of republican violence had gathered. The 'Love Ulster' parade, due to follow a route from Parnell Square to Leinster House, never got underway. About 300 protestors trying to stop the march from proceeding along the route broke the barriers and began attacking gardaí, photographers and journalists. Missiles including cement blocks, rocks, pipes, glass bottles and firecrackers were thrown. A refuse skip outside the GPO was also set on fire. 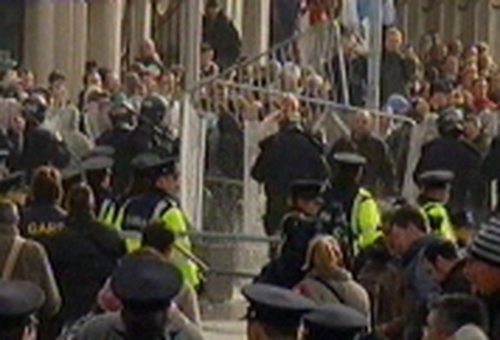 Businesses along the route were forced to shut as gardaí and members of the Garda Riot Squad forced the protestors down O'Connell Street. Further skirmishes broke out at O'Connell Bridge, Aston Quay, Fleet Street and Temple Bar. The most serious violence was in the Nassau Street area. Three cars were burnt out, windscreens were smashed and businesses had their windows broken. Gardaí say 41 people were arrested. Fourteen people, including six gardaí were treated in hospital as a result of this afternoon's disturbances. RTÉ can confirm that its Chief News Correspondent Charlie Bird was injured while reporting on the disturbances in the city centre this afternoon. He was admitted to casualty in the Mater Hospital, but has since been released. Dublin City Council has estimated the clean up operation for O'Connell Street will cost €50,000.